It's time for some Appalachian horror! * If you're anywhere near Blowing Rock, North Carolina in a couple of days, you'll want to check out "Terror in the Hills: Appalachia in Horror Films and Ghost Shows in the High Country" at the Blowing Rock Museum. * Just in case you missed it a couple of years ago, here is my husband's contribution to the countdown: "Larry's Unlucky 13 Best Boograss Songs." So, does the head on this statue really turn around on Halloween night? 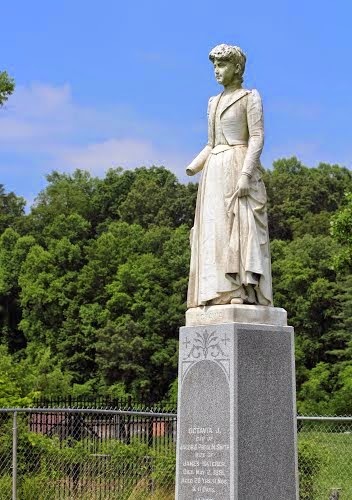 I suspect it doesn't, but the legend of Octavia Hatcher (1869-1891) of Pikeville, Kentucky is haunting enough without a restless monument. Here is an excerpt from the account posted by Jessica Forsyth, the Director of Activities and Events for the Big Sandy Heritage Center, a historical museum in Pikeville, Kentucky. "Octavia took to her bed, likely suffering from depression [after her baby son's death]. She grew ill over the next few months, slipping into a coma from which she could not be awakened. She was pronounced dead of unknown causes on May 2nd, 1891. "That spring was unusually hot, and as embalming was not yet common practice, no time was wasted in burying Octavia. Funeral services were conducted and her body was laid to rest. "Several days later, others began exhibiting similar symptoms to Octavia’s. The bite of a certain fly, now known as the tsetse fly, brought a sleeping sickness from which others began to awaken after a time. Hatcher and his family began to worry if Octavia might have succumbed to this illness. Her breathing had been shallow enough in her comatose state for doctors to believe she had passed, but in actuality, she had been buried alive. "Hatcher secured an emergency exhumation and uncovered a horrific sight with the raising of the coffin. The casket Octavia had been buried in had not been airtight. She had awoken from her sleep to find herself trapped beneath the ground. In a panic, she had torn the lining on the lid of her coffin. Her nails were bloody and her face was contorted in terror, scratched in her frenzy to escape from her grave. But by this time, she really was dead." And here is a video about her ghost story. Love today's creepy post! I'll have to check out the Terror in the Hills video. Larry's list of Boograss Songs is a winner! I look forward to re-listening to each one, most especially Knoxville Boy! It's a haunting song. And now the story of Octavia Hatcher! Poe was correct! What a terrible death! Woohoo! It was your mention of the boograss list that inspired this post, so I'm delighted that you enjoyed it! The students at the University of Pikeville have a much more effective way of creeping out the freshmen with spooky tales than we had at my school. I'm just saying. Why does no school have The Premature Burials as its mascot? Pikeville could start a new trend. Yay! So glad to hear it. Adelicia Acklen's life seems pretty calm compared to this, eh? Yikes, what a thought, being buried alive. I really do hope the story isn't true! It is a horrifying thought, isn't it? Apparently the legend is still disputed in some circles, so perhaps Octavia had a more peaceful end after all.